15 km away from Saint-Malo and 50 km from Mont-Saint-Michel, at the crossroads of Brittany and Normandy, CANCALE is both a seaside resort, a small fishing port and an oyster center. 300 m (by steep path), 650 m (by road) from the port, center and shops and 4 km from the beach of Port-Mer. 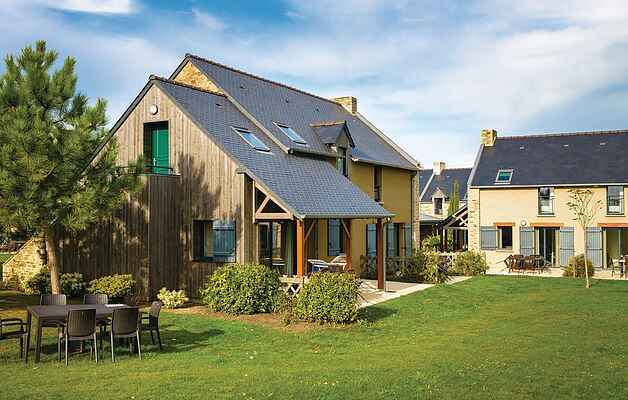 This residence consists of about fifty maisonettes (FBI075 = 3 rooms duplex 6 people and FBI076 = 4 rooms duplex 8 people) and apartments overlooking the port of Houle and open on beautiful green spaces overlooking the sea You are 15km from Saint Malo. 25 EUR for the baby kit. Semi-covered heated pool + whirlpool. Sauna access (8 EUR / session and 1 session offered / accommodation / week); Paying wifi access in the accommodation (20 EUR / week), bed or baby chair on request 15 EUR / stay, laundry. Dog accepted on request (2max) = 39 EUR / wk. Barbecue forbidden. "